Which type of anesthesia will be applied for surgery on rhizarthrosis (carpometacarpal osteoarthritis)? Shouldn´t surgery on rhizarthrosis always be performed under general anesthetic? What does the term brachial plexus block mean? What is the advantage of brachial plexus block for procedures on hands and forearms? Theoretically selecting general anesthetic for surgery on rhizarthrosis is possible. In fact, various departments select this option. Personally I prefer the brachial plexus block (anesthesia of the arm) for this type of surgery. The brachial plexus block most importantly provides several hours of pain elimination to a patient who underwent surgery on rhizarthrosis. Particularly in an area like the thumb saddle joint which is covered with pain sensitive nerve fibers, providing an extensive post-surgical period of painlessness is a true plus that a brachial plexus block is able to offer. In addition, the patient is allowed food and drink fairly shortly after the procedure. 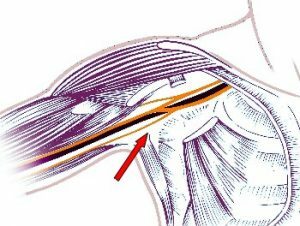 This form of regional anesthesia requires the injection of an anesthetic agent close to the nerves of the plexus in the shoulder area. 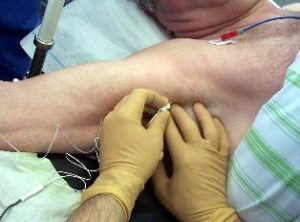 The most commonly used injection site in connection with a brachial plexus block is the armpit*. In medical jargon this site-specific procedure is also referred to as axillary block. For procedures on hands, forearms and elbows the injection of the anesthetic agent into the armpit is customary (see image above). Surgery to remove the trapezium bone must be performed on a bloodless operating surface. This considerably lowers the risk to injure a nerve or vessel. Close to the thumb saddle joint runs a very important central nerve along with a reasonably strong side branch of the radial artery. Only a bloodless operating surface will allow the surgeon the required visibility needed to accurately operate on the thumb! In order to avoid bleeding during surgery on a thumb saddle joint, a cuff is applied to the upper arm. 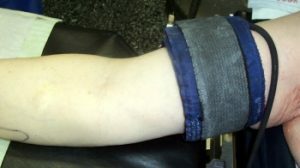 (Image above: The cuff applied here works similar to a blood pressure cuff). Just as the blood pressure cuff, the cuff used during surgery on rhizarthrosis is pumped up with air, creating an unpleasant pressure sensation on the upper arm. This pressure is maintained during the entire procedure! While experiencing brachial plexus block anesthesia however the patient does not consciously feel discomfort. This anesthetic method is much less stressful on patients than general anesthetic. Patients mostly appreciate that they are allowed food and drink shortly after the procedure. From a physician’s point of view this approach stands out because of the duration of numbness that keeps the patient painless for an extensive period of time without needing additional pain killers. If desired a light sedative can be injected along with the anesthesia in order to allow the patient to sleep through the process – without ever being completely out! Unpleasant noises as they inevitably occur for example during drilling into bone material can be suppressed almost entirely. All anesthetic methods which aim at numbing the entire arm will be experienced by the patient without almost any discomfort coming from pressure in connection with the cuff. Therefore most surgeons prefer the brachial plexus block when operating on rhizathrosis. (procedure on carpometacarpal osteoarthritis).